There are nearly 500 artists represented in the over 1,500 works in the collection of the Provincetown Art Association and Museum, and in choosing just 60 works for this exhibition we have necessarily excluded many artists. But, we think that this selection provides a fitting introduction to the depth and range of the hundred-year-old art colony. The early years of Provincetown's art colony (1920's-30's) can stand as a paradigm for the years that followed: the struggle between the old and the new that characterized the story of American art over the same period. The founders and stalwarts of the Art Association were painters: such as Charles Hawthorne (who could be said to have founded the art colony when he opened his art school in 1899), Richard Miller, and Gerrit Beneker, who were all members of the National Academy, and conservative to the core. The modernists were seen as a disruptive element, without regard for the canons of life drawing, perspective, or the real, (i.e., visual facts). Theirs was a conceptual viewpoint-that would reach its apex with the French artist, Marchel Duchamp, and his ready-mades. This was, after all, the era of Freud and Jung, Joyce and Proust, Stravinsky and Ives, Picasso, Matisse and Brancusi. In Provincetown the disciples of Hawthorne would be supplanted by those of Hans Hoffman in the 1950's. There are many common ties between so many of the artists in the collection the early generation who studied with Hawthorne, and then those who were Hofmann students, and finally, those who belonged to the Group Gallery or who exhibited at the HCE Gallery, and the members of the Long Point Gallery. Stubbs, who was born in the South, came to Provincetown to study with Ambrose Webster in 1931, and also studied in Italy at the Academia delle Belli Arti, in Florence, Italy. He had a love for the classic art of the past, personified by Piero della Francesca, especially his frescos in Arezzo, which Stubbs and his wife, Miriam, were able to film. Stubbs also felt himself part of his era: being modern in time, he was modern in art. His favorite paint medium seems to have been casein, a modern product. A water-based paint, caseins lend themselves to a sharp-edged technique, evident in our untitled example, with its pointed shapes that flip back and forth across the face of the picture, a unifying counterpart to the red ground that sets it off. 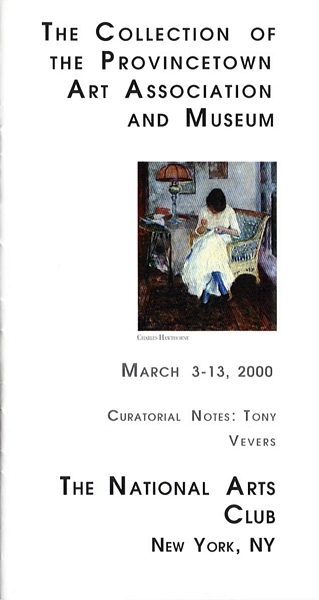 Other artists exhibited were: Elise Asher, Milton Avery, Robert Beauchamp, Gerrit Beneker, George Elmer Browne, Varujan Boghosian, Paul Bowen, Fritz Bultman, Peter Busa, Oliver Chaffee, Carmen Cicero, Arthur Cohen, Nanno deGroot, Edwin Dickinson, Jim Forsberg, William Freed, Sideo Fromboluti, Oscar Gieberich, Chaim Gross, Charles Hawthorne, Robert Henry, Franz Kline, Karl Knaths, Philip Malicoat, Leo Manso, Bruce McKain, George McNeil, Ross Moffett, Robert Motherwell, Arnold Newman, B.J.O. Nordfeldt, Stephen Pace, Pauline Palmer, Paul Resika, Alvin Ross, Sidney Simon, Nora Speyer, Jack Tworkov, Tony Vevers, Vaclav Vytlacil, and Agnes Weinrich.